You know your baby needs tummy time, but what if he screams when you lay him on the floor — and what can happen if he doesn’t get enough? We talked to an expert to get tips that every mom can use. Tummy time in your home may be easy as pie, or it may be fraught with stress and screams from your little one who doesn’t appreciate the chance to help build up his muscles. After all, he isn’t a little body builder, is he? The thing is, tummy time is important from the get-go and developmental delays can occur if he doesn’t get enough. We spoke with Kayte Langner, a parent educator with the Saint Joseph Parents as Teachers organization in Missouri. She says that tummy time is so important because it aids in the development of muscle and bone strength in the head, neck and core of a baby. “Muscle develops from the head down to the foot so it starts with just lifting the face off of the floor,” she explained. The traditional tummy time exercise involves laying your baby on the floor, on her tummy, and allowing her to try to lift her head off the floor. “The best way to go about it is to think of yourself as Baby’s personal trainer,” said Kayte. Your goal is to do tummy time in spells of 3 to 5 minutes at a time, with a goal of around 20 minutes a day. Tummy time on a hard floor is best because it offers the most resistance. Kayte said that if you work directly with the baby, you’ll get better results. “Get down on the floor with the baby,” she explained. “Have interesting things to look at. Talk and sing. Make eye contact. If someone is there with them then it will go better and last longer.” She shared that a mom of triplets had an extra large diaper-changing area, and she would do tummy time with each one after a change. “This way it was easy to make time for it with each baby,” she said. Kayte explains that if floor time doesn’t work out, there are other ways you can try to get tummy time in. However, “… alternate tummy time methods do not build as much muscle as quickly, so keep in mind that you will have to work at it longer,” she shared. If you carry your baby on your hip, facing out, it can help build muscle in the same way as tummy time on the floor does. You can also lay down with your baby on your tummy or your chest. Employing an ergonomic baby carrier can help build core muscles too. Baby can also lay on your arm facing the floor. Just hold on tightly to a leg. If Baby resists on the floor then roll up a flannel blanket and place it under the chest just below the armpits. This will help the baby keep her face up. Putting the bent arms under her chest will also help Baby push up off the floor. 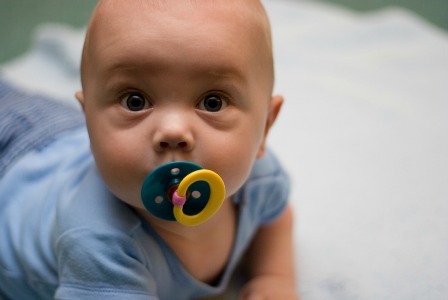 What if there is no tummy time? Not getting enough tummy time can lead to a number of issues, Kayte said. “If these muscles aren’t strengthened, then Baby will have delay in gross motor milestones like sitting and rolling over,” she explained. Muscle development consists of building blocks, with one muscle group building from another. Also, babies who spend too much time on their backs can develop problems such as flat spots on their heads or torticollis, which is an abnormal, asymmetrical head position. Some of these conditions require treatment, physical therapy or other measures, such as corrective helmets. Your baby’s health and development: What’s normal? Does “mother-ese” help or hurt verbal development?